For those who collected the line several years ago, Upper Deck Masterpieces were some of the most beautiful cards for their time. After sticking around primarily as a high-end insert, the brand is back as a standalone product with 2014-15 Upper Deck Masterpieces Hockey. It's an artistic take on the NHL's stars of both today and in the past. Boxes come with a total of three hits including at least one autograph. 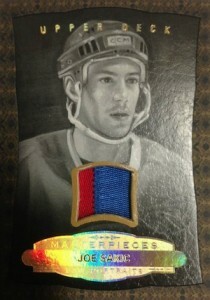 The 2014-15 Upper Deck Masterpieces Hockey base set has 240 total cards. 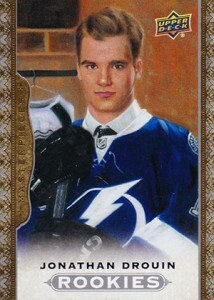 Of these, 180 use original paintings of current and retired players. Among them are 15 rookies. The remainder of the set consists of 60 Wire Photos cards (1:3 packs). These were last seen in 2011-12 Parkhurt Champions Hockey. Basic parallels include Red-Framed Cloth (#/100) and Black-Framed Leather (#/50). 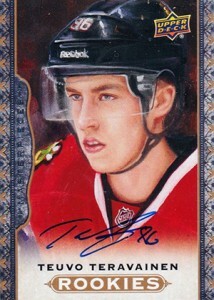 Most of the signed and memorabilia cards are essentially parallels as well. All 2014-15 Upper Deck Masterpieces Hockey autographs are signed on-card. Besides basic versions, there are Red-Framed Cloth (#/30 or less) and Black-Framed Cloth (#/15 or less) cards. Red-Framed Cloth Memorabilia cards are numbered to 85 or less while Black-Framed Prime Memorabilia versions come with premium swatches and have no more than 65 copies each. 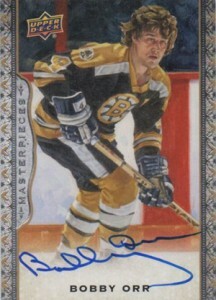 Masterpiece Portrait cards have original artwork painted directly on the card. The checklist has 20 subjects, each hand-numbered to 10. GUY CARBONNEAU SIGNED 14-15 UPPER DECK MASTERPIECES CANADIENS CARD AUTOGRAPH!! Individual Odds: Short Prints - 1:1.5 packs, B/W Portraits - 1:6 packs, Rookies - 1:6 packs. Individual Odds: Base - 1:4.5 packs, Muti-Player - 1:22.5 packs. Not all subjects available in each parallel. View the full spreadsheet for specific print runs. View the full spreadsheet for specific print runs and relic pieces. 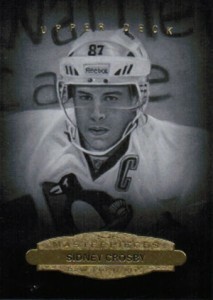 Looking forward to this product from Upper Deck. I love the wire photo cards. really nice product.has mostly the stars of the game also. It is basically Parkhurst Champions without the mini cards and a few rookies and jerseys thrown in. Just not as good since it is fewer autos for a higher price. And of course fewer dinosaurs LOL. As a case break product it does not work well as a few teams seem to get the majority of the hits and some teams get a single rookie card (twice) and probably nothing else in a 10 box break. It can be a very nice product for a set builder or auto collector but the price will need to come down to the Parkhurst Champions level before it will be worth while. Nice product. The problem with this specific collection is that people either really like it or really don’t. Many clients of mine will not buy these cards because of the design. Personally, I find some of the pictures really nice, but others are really ugly. Take Galchenyuk for exemple. The drawing is absolutely horrible. Also, as a general observation, I don’t understand how in the world Upper Deck manages to destroy that many cards. For the Fleer Showcase I pulled a P. Roy with patch /10 without the patch, and now a Masterpiece Portrait (Ovi) /10, again destroyed! *Ryan, I don’t understand one thing: the odds for the base autos seem to have a small problem B – 1:388/C – 1:428. Isn’t supposed to be the other way around or is a 1 missing in front of the 388 of the B? TCB � Those were the odds provided by Upper Deck. The explanation is that while the Group B cards are likely more limited per player, there are 18 cards in the group. Group C only has eight cards, so they are tougher to hit overall versus Group B.
I took a break from the hobby for many years, but I am really enjoying collecting this set. 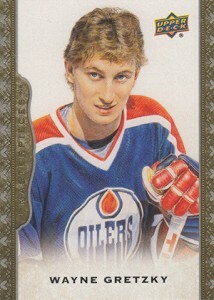 There are so many different sub-sets to focus on; autographs, memorabilia, b&w portraits, wire photos (which I personally don’t like), gretzky has 50 cards! and they get rarer from gold to red to black, which is a cool dimension. The set itself is a little weird in that it has certain non-impact players, while ignoring others from NHL history and it is highly focused on the Original 6, which makes sense. 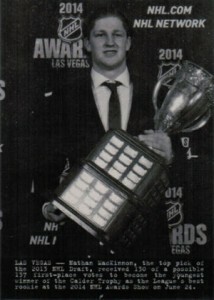 For example, we get a Scott Laughton card, but no Mike Green or Denis Potvin. Pelle Lindbergh but no Billy Smith. Vancouver is basically ignored, too – there’s no Messier on Vancouver and no Bure at all. Minor selection process details, I guess, plus it is not a comprehensive season set, it is a collectors set. 1) My assumption is that if a card is #d/15, for example, that the entire population of said card is 15, no more, no less. Is that really true? 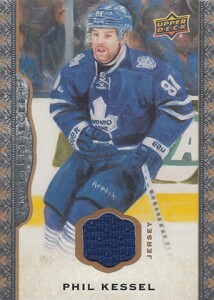 2) I see a lot of off-center cards, meaning the borders are out of alignment. Some are pretty bad. Is that a big deal? I mean, if the answer to my first question is true, then an off-center #d/15 would still be worth collecting, I’d say. Agree or disagree? James � Cards #/15 mean there are 15 copies of that particular version, all of which should be serial numbered. Off-center cards do impact value. Depending on how bad/noticeable it is and the card, it might not mean a big drop but it could. Thanks very much for answering my noob questions, Ryan. Yes, I get that there are 15 versions of said card, numbered 1-15/15. I guess my question is: Does UD run 1 set of 15 or 1 million sets of 15? Love your work here on cardboardconnection. Thanks. James � Most sets nowadays have several levels of parallels, all usually to differing quantities. We list what we know on checklist so you can see how many there are (some sets have a lot more parallels than others). 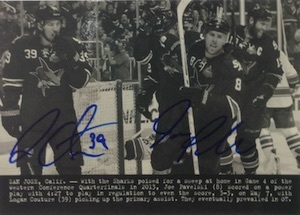 Wooow, just broke 1 box and got a Gretzky Wire Photo autograph for Edmonton, awesome product ….